Three Ontario lawyers have notified us that they have been contacted by the purported Theresa Hartman with regards to a collaborative family law agreement dispute. This is a fraud we have seen before under several other names and similar scenarios. For details on how this fraud works and a full list of names attached to it see our Confirmed Fraud page. this matter if need be. Good day to you and thanks for responding to my email. Please pardon my late email response as my condition does not allow me to stay long on the computer. Your consultation fee shouldn’t be a problem, kindly send me your firm fee / retainer agreement for my review and upon receipt and if OK, I will make immediate provision for the fee. My name is Theresa Hartman. I am a lender who lends companies and individuals funds on a fixed term to invest and in return pay back with interest. 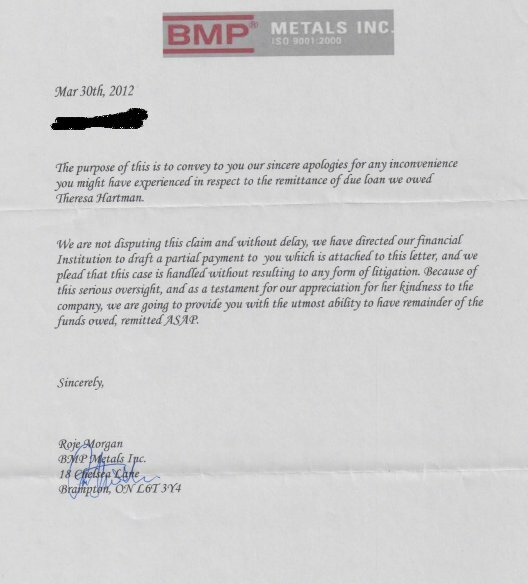 On September 7th, 2009, I lend BMP Metals Inc. who’s located in your jurisdiction the sum of $750.000.00 with interest on two years fixed term and to pay back September 7th, 2011. 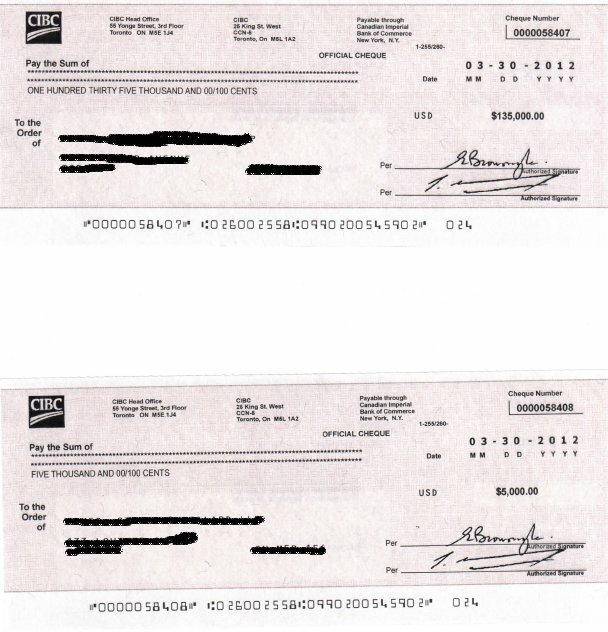 They had paid me $250,000 but still owing $500,000. There has not been any attorney working on this case. Different payment dates have been promised and I still have not received anything. I was advised to seek legal assistance in my borrower jurisdiction which is why I contacted you to act as my counsel in retrieving these funds. My last contact with my Borrower, I was told I would receive payment not later than Mid January 2012 and till now, nothing has been paid. Kindly let me know what your fees would be in order for me to inform the company to expect contact from you as you have been authorized to act on my behalf. I would like to forward your details to them on your approval, so they know a law firm is representing me and I can sue for breach of agreement if they don’t keep their promise. I would like to give them this last chance to fulfill their obligations before we start legal proceeding. Please do get back to me so I can furnish you with the required details to contact my borrower on my behalf as I know these companies respect law firms and do not want to be carried to court. Before we proceed, kindly forward your fee/retainer agreement for my review and if okay upon receipt, I will make immediate provision for the fee for you to begin work. Thank you for your anticipated co-operation and understanding. Contact me should you require more information. I have attached here a copy of the Loan Agreement Promissory Note and proof of partial payment they made for your peruse. My borrower’s name is BMP Metals Inc.
You must complete the attached form. My regulator requires this information. I will charge you $450 an hour. The total fess and disbursements will depend on how much the defendant BMP resists and how difficult it is to actually collect your money. I see that the one payment of $250,000 was by way of a Cashier’s Check. A bit odd. Your hourly fee is accepted. Kindly send agreement for my review and if OK upon receipt; I shall make immediate provision for the fee. I do not think this matter will result to litigation as they are not disputing the claim neither do they want to contest it. All I need is a reputable law firm like yours to act on my behalf as I am sick of their various excuses. They agreed to pay but kept giving me numerous excuses and turning me around. Each time they noticed I am about to seek a legal counsel to sue for breach of the agreement we had, they always come up the notion that they want to pay and the moment I cool off, they won’t come up with the payment. I am seeking a counsel basically because it is taken much longer for them to come up with the reimbursement as agreed on the Note, and I know with a counsel involvement, these funds would be release as soon as possible without going to court. After I notified them of my intention, they have already requested for your firm contact details to enable them establish contact with you and set up an arrangement on how to remit the money they owed without delays or possible litigation. Kindly send me your firm fee / retainer agreement for my review and if OK upon receipt; I shall make immediate provision for the fee.